A group of Bristol City football supporters who rampaged through a pub after a match against Cardiff City in the Welsh capital have been handed lengthy bans from grounds. Violence flared following the game in February outside Cardiff City Stadium and on St Mary Street in the city. Hooligans smashed furniture at the Great Western pub and let off flares. The five ringleaders were banned from all football grounds for between five and eight years. South Wales Police mounted a detailed investigation to arrest those responsible for the disorder, painstakingly going through CCTV footage to identify the offenders. In total, 32 men have been convicted of public order offences as a result of Operation Panther. The majority of those caught on camera have been handed three year banning orders by Cardiff magistrates. 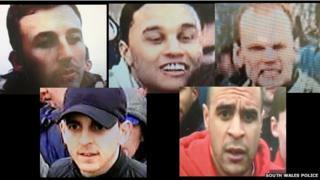 But the main culprits of the violence - all from the Bristol area - have been given extended bans, after hearings in Cardiff on Thursday. Michael Harding, 30, was given an eight year banning order and a three month suspended prison sentence. James Labruna, 26, and Duran Thaws, 30, were each given six-year orders and eight-week suspended prison sentences. Dean Ford, 27, was given a six-year order and jailed for four months. Luke Selman, 23, was given a five-year order and a 12-week suspended prison sentence. Speaking after the case, the South Wales Police football liaison officer Pc Christian Evans said: "Unfortunately a small minority - less than 3% of the travelling contingent - were intent on causing trouble. "These are not scenes we are used to seeing in Cardiff and we are committed to keeping football a safe environment. "The involvement of these 32 men and the weight of evidence have been reflected in their guilty pleas." Tom Williams, football liaison officer for Bristol City Football Club, added: "The Avon and Somerset Police Football unit have been working with colleagues from South Wales Police for the duration of Operation Panther. "The sentences handed out as a result of the post-match inquiry into the disorder in Cardiff sends out a strong message to those individuals intent on committing football related disorder. "We would like to thank South Wales Police, and particularly Pc Christian Evans for leading the inquiry."